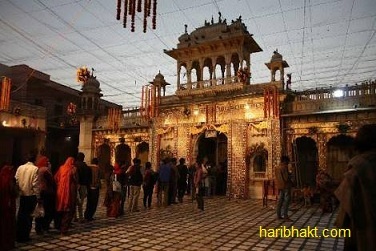 Shri Manshapurna Karni Mata (मंशापूर्ण करणी माता मंदिर) Temple is situated in Deshnoke‎, ‎Rajasthan‎ with Rajput architectural styles‎. The construction comprises of the center of a beautiful courtyard, the outer boundary wall of which has been constructed like a beautiful wall fort. The boundaries are built very high with four ornamented pillars and the provision of a huge platform for the guards to protect the miraculous temple. Karni Mata is worshiped as the incarnation of the goddess Durga by her followers. 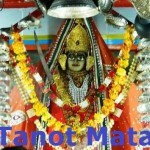 She is an official deity of the royal family of Jodhpur and Bikaner. She lived an ascetic life and was widely revered during her own lifetime. At the request of the Maharaja of Bikaner, she laid the foundation stones for two important forts in the region. The most famous of her temples is in the small town of Deshnoke, near Bikaner in Rajasthan, and was created following her mysterious disappearance from her home. The temple is famous for its white and black rats, which are treated as sacred and given protection in the temple. Contrary to some unverified reports, the temple is not affiliated with Jainism. Another temple dedicated to her during her lifetime differs from others in that it does not contain an image or idol of her, but rather contains a foot-print to symbolize her visit to that place. 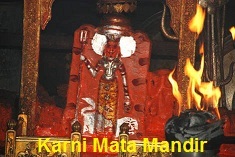 Karni mata is also referred to as Nari Bai. An interesting historical incident suggest that she remained celibate till her death (which is unknown, no one knows when or how she died). 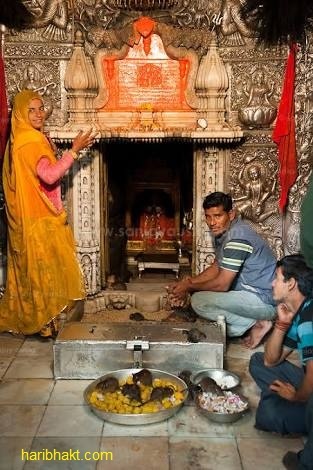 Karni mata was originally the wife of depoji Charan of the village of Sathika. However, she later expressed to her husband her unwillingness to engage in matrimonial relations. He initially humoured her, thinking that she would relent in time. Instead of doing so Karni arranged for him to marry her own younger sister Gulab so that he might have a proper married life. She herself remained celibate all her life, with the concurrence and support of her husband. The next wonder of this temple, are the rats. These rats commonly known as kaaba reside in the temple. 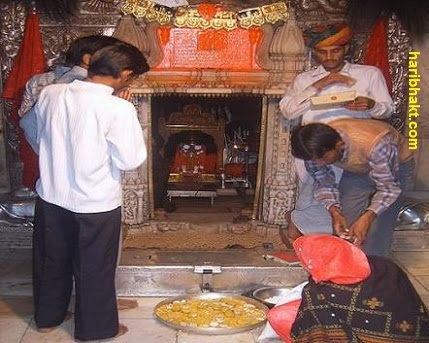 The post is created based on the impressive incidents of Shri Karni Mata mandir. According to an incident, shri Karni Mata once restored a dead child of her devotee back to life from Yama (the god of death) then mata announced that no one from her tribe would fall into Yama’s hand again. Instead, when they died all of them would temporarily inhabit the body of a rat (kaba), before being reborn into the tribe. 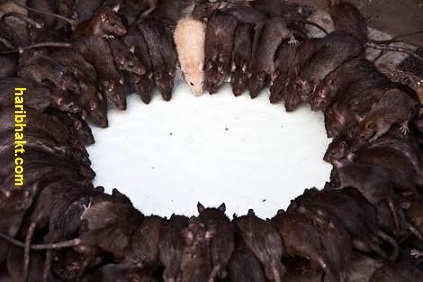 A normal person gets scared over the thought of being surrounded by huge number of rats (it is said that they look like a rat, but actually they are not rats). However, the outstanding fact is that these kaba’s are harmless and play around in the temple without disturbing the devotees, rather they sit on their laps, shoulders, head, hands which the devotees think to be the divine spirit and blessings of the Devi. They never harm or bite anyone. Neither they create nuisance, a natural trait of rats. Nor they fight among themselves. One would surely wonder after knowing the fact that when the killer disease plague spread out in surat (gujrat) in mid 90’s people from surat and other affected areas went to the temple to take the milk and water drunk by these rats as medicines to get themselves cured. Stunning is n’t it ! The beauty about these kaba’s is that, despite being innumerable in number, they never come out of the temple boundaries. Moreover with the blessings of Shri Karnimata they get their food, shelter, lodging and their life cycle continues inside the temple itself. The miraculous fact is that no disease related to rats have been found till date. Niether the temple stings of foul smells nor it is dirty anywhere. Infact even the offerings like milk, sweet, cereals, water and groundnuts are first offered to these holy kaba’s and then distributed among the devotees, which is consumed by them as a holy prasad. Especially, the water which these kaba’s drink is considered very holy and auspicious. There has been no trace of how these kaba’s are reproduced, infact it is believed that these rats have their own VIP maternity hospital which takes care of their delivery. Moreover there has never being a trace of baby rats. All the kaba are of a standard size and weight without any changes down the ages. It still amazes visitors of this temple. Rats are usually considered as an animal who are afraid of human beings. But here in karnimata’s temple under her shelter these kaba’s are scattered all over the temple, rule the temple like a king and roar like a lion and roam about freely & comfortably. Strange is n’t it ! Shri Karni Mata is the incarnation of Devi Hinglaj or Devi Durga (The Goddess of Power and Victory. Goddess Durga is synonymous with Shakti, the cosmic power that wages an eternal war against the evil and also the energy of life for everyone). The whole life of Shri Karni Mata was full of miracles and even after her disappearance from the earth, her innumerable devotees have experienced her merciful blessings in form of help in their life. The word disappearance has been used, because it wasn’t a natural death of Shri Karni Mata, rather her human body disappeared in divine light at her desire. 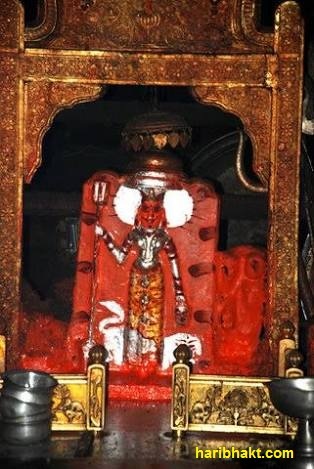 Shri Karni Mata was born on Friday, Ashwin Shukla Saptami 1444 i.e. October 2, 1387 AD in village Suwap near Phalodi in Jodhpur District, Rajasthan. 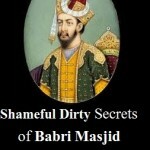 Her father was Mehaji and Deval Bai was her mother. Mehaji was a staunch devotee of Hinglaj, a Shakti Peeth (Holy Shrine) in farthest of Baloochistan’s (at present in Pakistan) Lal Bela area, about 18 kilometres north of Arabian Sea. Once for the whole night, Mehaji prayed to mother Hinglaj that “His name remains alive forever”. The next morning he heard a voice mentioning “Tathastu” (Yes, it will be). When Karni ji was six years old a snake bit her father in the jungle. She put her hands on the effected limb and removed the poison. This way she saved the life of her father. Meantime, the stories of the miracles of Karniji had begun to spread far and wide. Rao Sekha of Pugal also heard about her. He wanted to take revenge on his enemy. So he went to Karniji to seek her blessings for victory. Rao Sekha met Karniji on the way while she was taking meal for her father towards the field. He begged for her blessings. Karniji welcomed him and asked him to visit her house. Sekhaji begged her pardon, due to paucity of time at his disposal and desired to leave, but Karniji would not let the guest go without having the meal. She offered him food, which she was taking for her father. Sekhaji knew that the food was not enough to be served to his army accompanying him. He therefore asked his men, to accept whatever she served and not to ask for more. Abiding by his orders, they forwarded their utensils to be served and Karniji served the roti and the curd from her pot one by one to every soldier. When she went from one soldier to other, her pot never emptied of curd and rotis. Seeing this miracle all the soldiers were amazed. Rao Sekha achieved victory over his enemy and none of his soldiers died, except one, who did not eat the breads and curd treating it as a bad omen. Karniji’s aunt sought her blessings, so that a son is born to Mehaji (Karniji’s father), as an outcome of which two sons were born to Mehaji named Satal and Sarang and also one daughter named Gulab Bai. By this time Karniji became over aged & her parents became anxious for her marriage. Inspite of their best efforts, they could not find a suitable match for Karniji. Seeing her parents anxious & worried, Karniji herself suggested her father to go to village Sathika and talk on her marriage with Depaji, son of Rao Kelu- a great Philosopher of that area during that time. According to history, the marriage took place in 1416 AD, in a quite simple manner. When the marriage procession was returning to Sathika from Suwap, the people, horses and cattle felt thirsty, but there was no water nearby to quench their thirst. Karniji at that time indicated a certain place behind a sand-dune for water. Everyone was amazed to see a tank full of water. The bridegroom Depaji went to Karniji’s doli (palanquin) and raised its curtains to thank her. He was amazed to see that, inside was a Goddess sitting beside a lion. After a few seconds Karniji transformed herself into human body. She told her husband to marry her sister Gulab Bai, mentioning that she was born on the earth only to serve people. On the way to Sathika there was a village named Kaluja. The villagers already aware of her miracles requested her to solve their water problem. She blessed and told them to put her idol made of clay in the well and abstain from cutting trees. Soon the well was found to be full of water and still exists. Today this well is known as “Shri Karnisagar”. The development of Rajasthan’s Royal families revolve around blessings of Karni Mata. Rao Jodha, the founder of Jodhpur, was Karniji’s devotee. She blessed him, with her help in 1453 AD, he recaptured Ajmer, Merta and Mandover (now known as Mandor). In 1457, she went to Jodhpur, on Rao Jodha’s request to lay the foundation stone of the renowned fort of Jodhpur. During her stay at Mandor, Shri Amara, the Charan of Mathaniya (a village) requested her to visit the place and sought her permission to construct her temple there. She accepted his request and asked him to put her footprints instead of her idol in the temple. 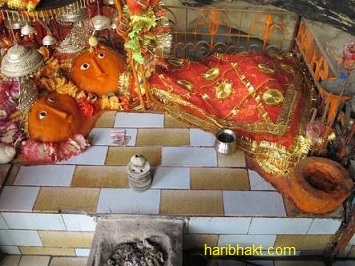 The temple of Mathaniya is the first temple of Karnimata built during her life. 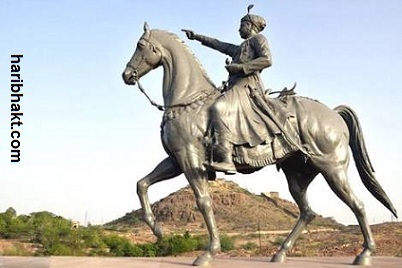 Rao Bika was the fifth son of Rao Jodha of Jodhpur. He came to Jangloo area with his uncle Kandhalji to establish a new kingdom, a state that would belong to him. He stayed at Deshnoke serving Karniji for many years. He carried out his mission under the guidance and blessings of Karniji. Karniji helped Rao Bika in carrying out his mission. She solved his problems from time to time. The biggest hurdle was the enmity and bitterness between Rathors and Bhatians. Karniji decided to remove this problem. To pacify this and facilitate smooth success for Rao Bika, she arranged the marriage between Rao Bika and Rang Kanwar, the daughter of Rao Shekha of Pugal. Rao Shekha, during that time was imprisoned at Multan. Karniji brought him from there overnight, to Pugal on the day of marriage in 1472 AD Thereafter, Rao Bika, smoothly succeeded in his goal. Rao Bika finally got the foundation stone laid by Karniji for his Durg (Fort) and Bikaner City in Rati Ghati (valley) in 1485. Bikaner City and the Fort were inaugurated on Vaisakh Shukla Divitiya V.S. 1488. During the time of Rao Bika’s efforts to establish his own state, Shri Jeevraj, a Charan from Kathiawar, came to Jangloo area with good horses. Kandhalji, uncle of Bikaji purchased the horses but couldn’t pay the full price and for part payment, gave him the Jagir of Chhotadia (Now in Ratangarh Tehsil of Churu District). People of Chhotadia did not accept Jeevaraj as a Charan of their grade and cadre. Jeevraj being dissatisfied went to Karniji and complained her about the behaviour of the Charans of Chhotadia. Karniji married her grand daughter “Shanpu” with Jeevraj. Thereafter to pacify the Charans of Chhotadia Karniji herself visited the village Chhotadia several times. 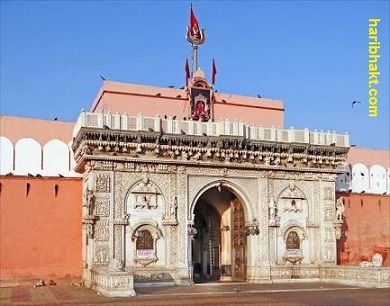 Presently situated in Chhotadia is a famous temple of Karni Mata. In 1538, when Karniji had attained the age of 151 years she went to Jaisalmer to cure some unknown disease of the Maharaja. At that time, she went to village Kharida to visit her sister. There lived a carpenter named Bana, who was her devotee. He was blind. Karniji called him and said, “I will bless you with eyesight, so that you can see me, and when you see me carve out my image on a sandstone as per what you see. On finishing the carving, put my idol under your head and sleep. When you awake, you will find yourself in Deshnoke outside my cave. You have to install my idol in that cave. On completion of this job, you will get your eyesight for good”. 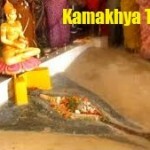 After Bana completed his work and obeyed the orders, the idol was installed in the cave as desired by Karniji. The image that Bana carved is not the image of Karniji as she actually existed in human form. Infact the image carved is an incarnation of Durga. The mouth of the image is a bit long, there is a crown on the head, round earrings, a necklace round the neck and bangles on both the hands. There is a Trishul (a weapon having three prongs on the upper part) in the right hand and in the left hand hangs the head of a demon (in human form). At the lower end of the Trishul there is a head of buffalo. Thus Karniji had imaged herself in the idol as an incarnation of Durga & did not allow to worship her as an idol of human being. This is why she did not allow her idol in Mathaniya, permanently. On the first day of “Chaitra Shukla” 1595 (Vikram Samavat) i.e. 1538 AD, Karniji with her stepson Poonraj, started her journey for Deshnoke. She reached Dhaneri Tank on “Chaitra Shukla Navmi”, i.e. 21st March, 1438 AD. It is situated between Gadiyala and Girirajsar of Kolayat Tehsil in Bikaner District. She stopped her chariot at some distance from the tank and expressed her desire to have a bath. Poonraj looked in the water pitchers and found them to be empty. Karniji asked him to fetch water from the tank. When Poonraj went away, she told the saarthi (driver) of the chariot to see whether there were any drops of water in the pitcher. There were a few drops in it. She asked the driver to pour the drops on her head. At that time she sat in Padmashana pose (a Vedic posture in meditation) gazing at the sun. As soon as the drops of water fell on her head a divine light flashed and her body disappeared in form of light. When Poonraj returned, he enquired about the incident that occurred. He cried. At that time a voice was heard telling, “Return to Deshnoke, you will find a carpenter there sleeping with my idol, outside the cave. Install that idol in the cave. I will remain there forever and help all those who pray there with faith and pure heart”. 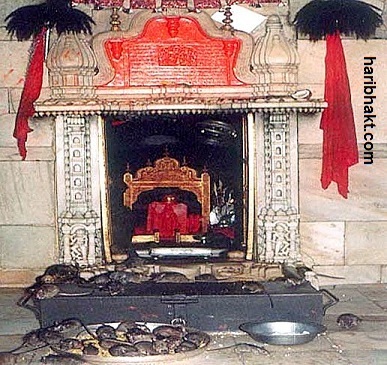 This long period of 151 years of Shri Karni Mata’s life is full of miracles. Only a few of them have been mentioned here in brief. Her merciful miraculous deeds have been and are still being experienced by her devotees, even after her disappearance. 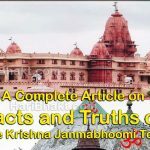 As per Hindu conviction, the acts of Generation (Uttpati), Operation (Paalan) and Destruction (Sanhar) are performed by the Supreme Power, who is Bhagwan. 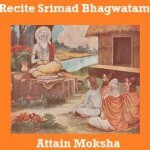 These acts are not possible without “SHAKTI” – The Power. The goddess of the power is DURGA and KARNIMATA is incarnation of the Durga – the goddess of Power. Karnimata the incarnation of Maa Hinglaj (Baluchistan, now in Pakistan this is one of the shaktipith out of 51 shaktipiths of Devi Durga). The devotees get this divine power at the time of worship and feels through out of the day. In Hindu history, the rat is considered the vehicle of Devta Ganesh, son of Maa Durga (Parvati). Since here rats live in thousand numbers it’s obvious that Ganesh (Son) should be living here. Once the son resides at the place, naturally the mother “Durga – the goddess of Power” will also accompany her son (Ganesh). Devotees can obtain the same power from mother by worshipping at this temple. Deshnoke is only 30 KM from Bikaner (by road). Bikaner is well connected through National Highway with Delhi, Agra, Jodhpur, Jaipur and other cities of India. Rail: Rail service is also there, you can reach Bikaner by meter gauge or by broad gauge train. Airport : The airport is in Jaipur, Agra, Jodhpur and Delhi. Bikaner is about 450 KM by road from Delhi, 350 KM from Jaipur, 350 KM from Jodhpur. The condition of the road is good. did you believe or is that true what Scholar Fauzi Saeed said it ??? if you don’t know what she said? just google and type “Scholar Fauzi Saeed” know it what she said … is that true said?